Wedding bands are a symbol of a couple’s lifetime commitment, and bridal jewelry from A. Jaffe is designed to last a lifetime! Styles for men and women are born from a heritage of quality, with the utmost care and attention paid by master artisans. Wedding bands are available in platinum, 18K yellow, 18K rose and 18K white gold, with or without diamonds. 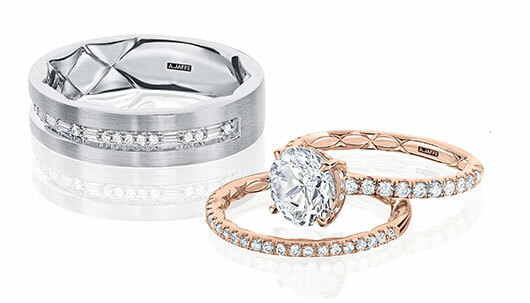 Her band can match her A.Jaffe engagement ring, while his can complement her bridal set. You can count on a wedding ring from A.Jaffe being beautiful, comfortable and durable; the company puts a lifetime guarantee on it.